Looking for a inexpensive gift to give this holiday season? 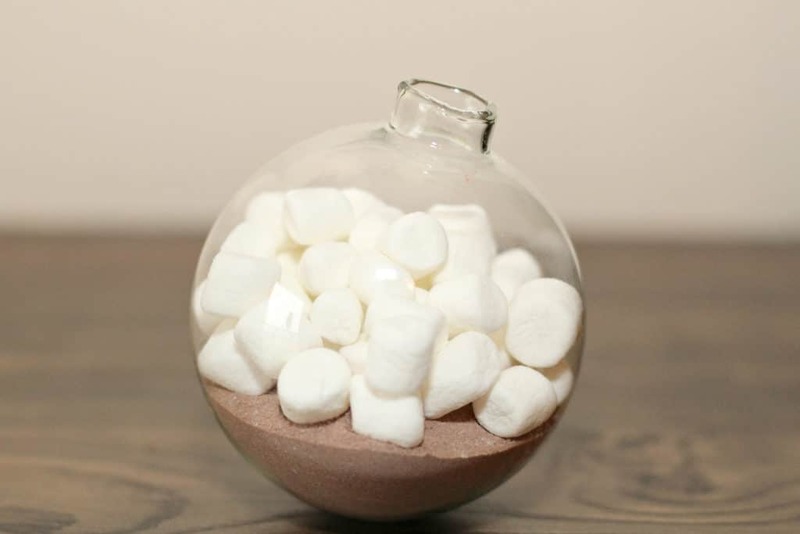 Whether you need a gift for a mailman, teacher, cousin, sister, friend or children, this Hot Cocoa Mix is a fun way to warm up! 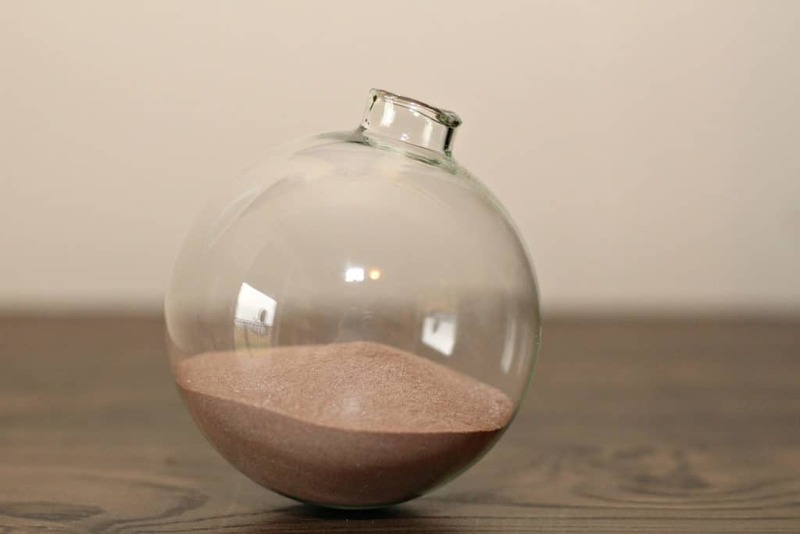 If you already have jars on hand, you can totally layer this in a jar. 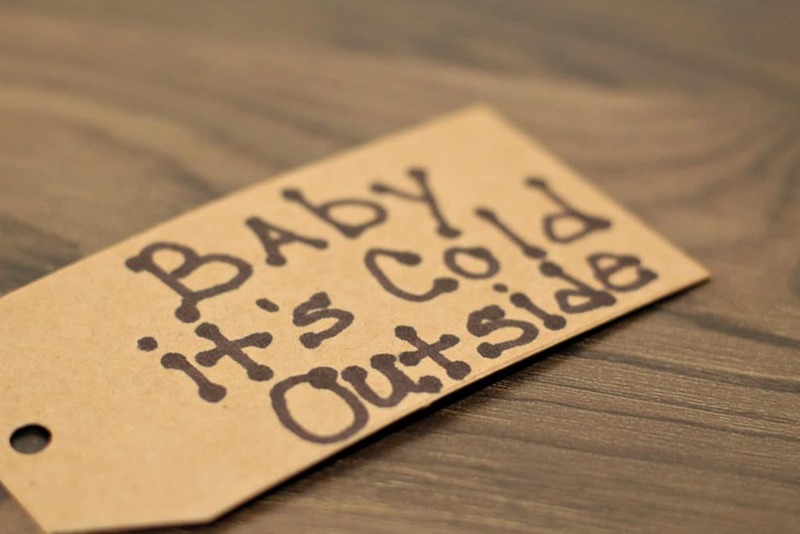 Attach a tag to the gift recipient with how much water or milk to add so that they can dump the ingredients in and enjoy a hot cup of cocoa! How Do You Make Hot Cocoa Mix Without Powdered Milk? Have you seen my Hot Chocolate Mix Recipe? You can make this at home and is a great alternative to pre-packaged hot cocoa mix. Simply leave out the milk and vanilla extract, attach a tag letting the recipient know they should add 4 cups of milk and a teaspoon of vanilla extract! I actually have a printable already available, so go ahead and head on over to that recipe! Start by removing the top of you ornament and placing the funnel in the top. 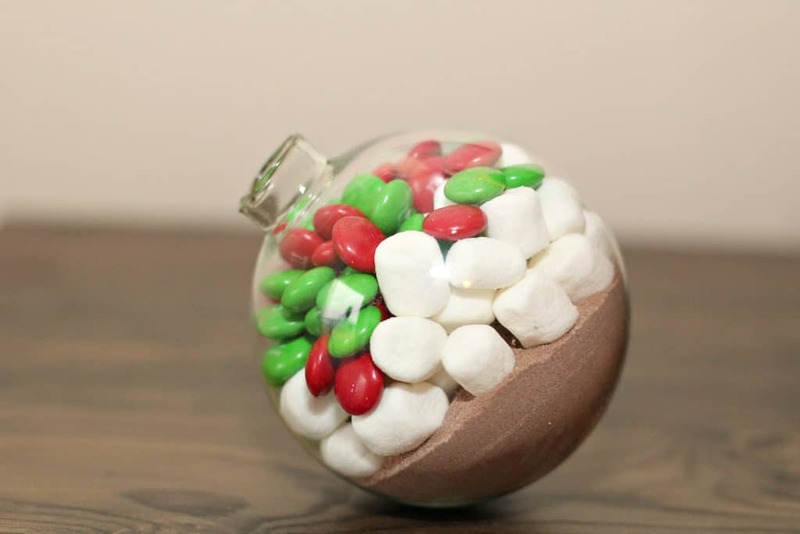 Fill the ornament 1/3 of the way full with hot chocolate powder. 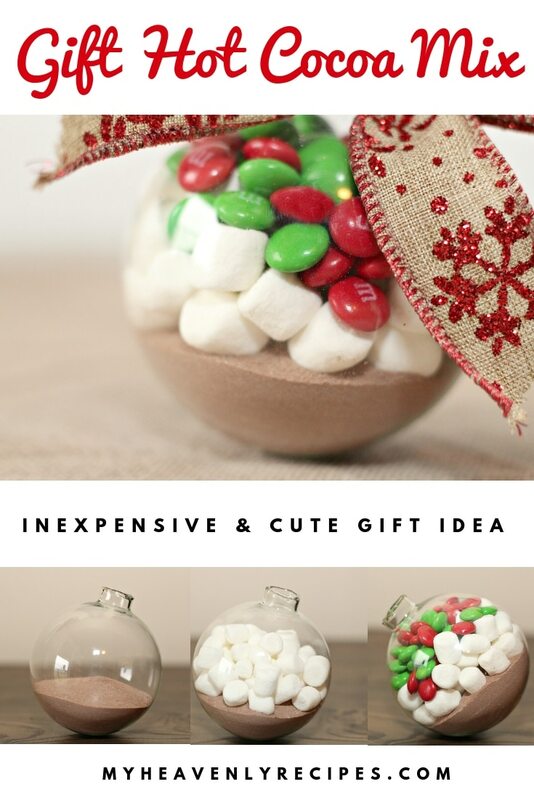 Remove the funnel and place mini marshmallows into the top of the ornament, filling it another 1/3 of the way. 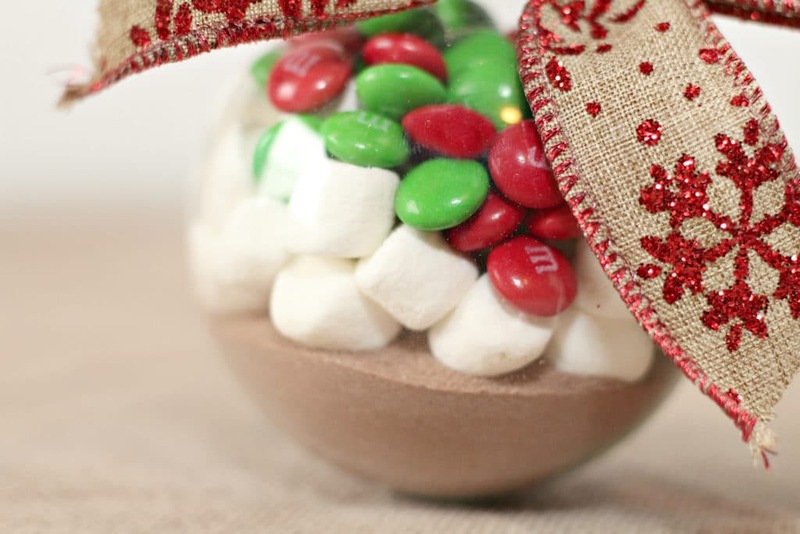 Next do the same with your green and red M&M’s until the ornament is filled. Place your top back on the ornament and tie your bow around it. Secure your gift tag to the ornament. You can hang these on your tree until it is time to pass them out. 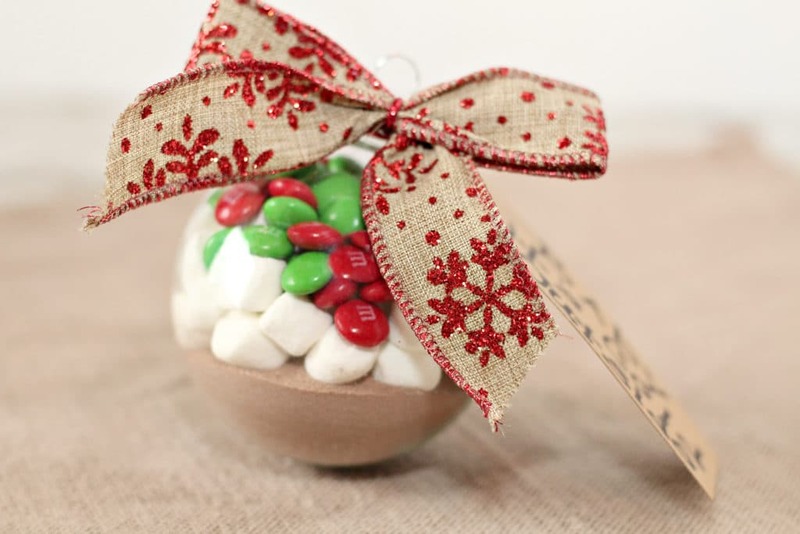 Decorations you can EAT! Note: If following the WW FreeStyle Plan, most hot cocoa mixes are 6-8 SmartPoints per serving.